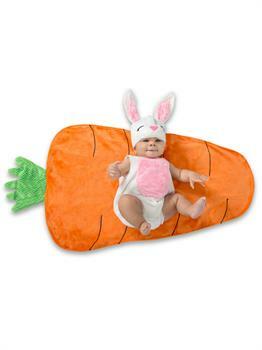 Show all of your friends that your baby is the cutest little bunny in town with the Baby Swaddle Wings Bunny Costume. They’ll look like they’ve just emerged from a picturesque burrow in this nature themed outfit. Your baby will feel snug and warm in their nature themed costume this Halloween. This product comes with the most adorable swaddle blanket, body and hat with attached bunny ears. Watch as they enjoy their very first Halloween in a bunny costume that’s sure to create some memories you’ll want to hang onto.Our favorite Easter Bunny is here and all kids should behave nicely to get colorful eggs. Animal theme costume will be the first choice if you want to wear a cute and fluffy costume. Who doesn't love fluffy and adorable bunnies? Lets blend your imagination and your kid's choice for getting the perfect party costume. Do you want a classic costume for your kid or you want a creative outfit? Your search for a perfect Halloween costume comes to an end with our Baby Swaddle Wings Bunny costume.